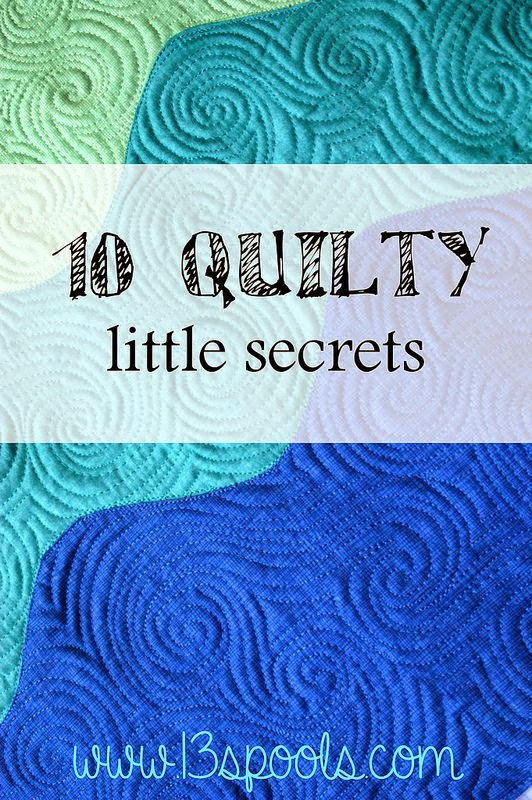 After reading Molli Sparkles and 13 Spools, I decided to make my own list of 10 Quilty Little Secrets. 1. My favourite part of quilting is piecing the quilt. If I had the money, I'd leave the quilting to someone else. 2. I sew over pins. If I take the time and put them in correctly, no problem. Other days, I'm lazy, and I bend a pin...or two. 3. Although I love the convenience of basting spray, I will often pin a quilt. I find I get puckers in the backing when I use spray, no matter how much effort I put into smoothing. 4. I need a pattern. 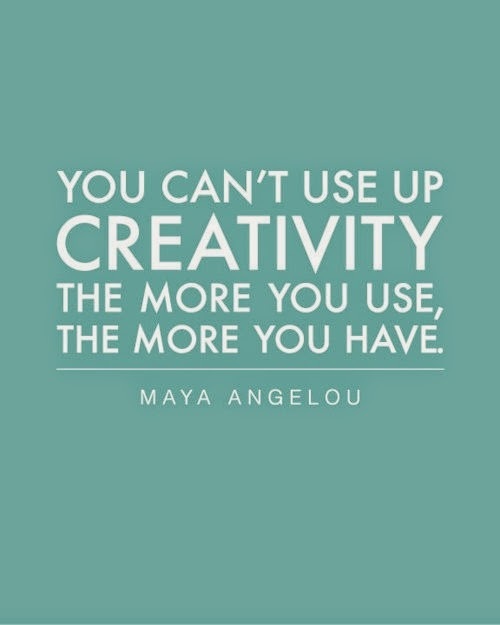 I'd love to be able to create something in my head, but I'm not there yet. 5. I never hand sew my binding. Machine binding all the way. Who has the time? Or the patience? 6. I. Hate. Paper. Piecing! 7. I have far too many UFO's/WIP's. See #1, and I always see something new I want to make. I need to stop looking at magazines and on the internet. 8. I pre-wash all my fabric. It's a chore, but I'd rather the fabric shrink at the beginning of the process rather than at the end. 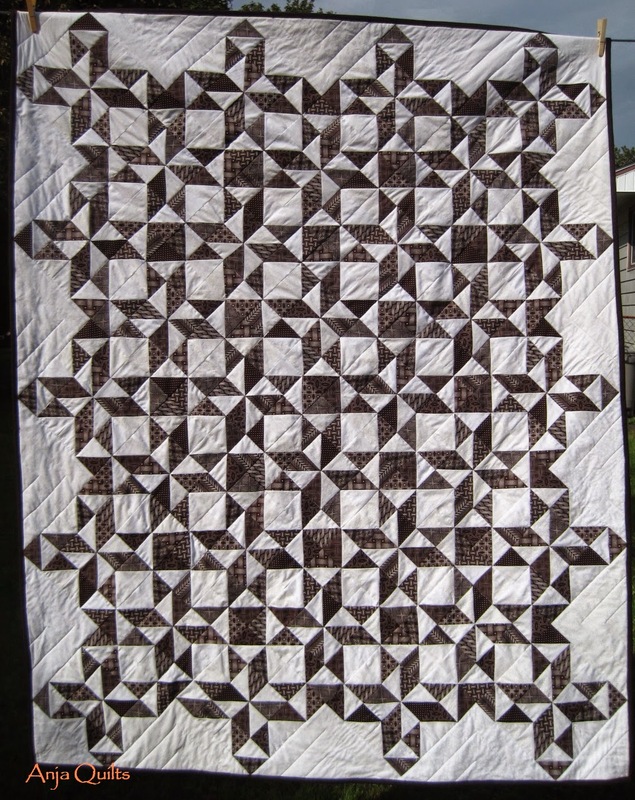 I don't like to wash a finished quilt -- I like the crisp look. The crinkled look makes it feel used. 9. I forget to change the needle in my machine. Thank goodness I break needles from running over pins (see #2) from time to time; otherwise, the needle would never get changed. 10. What is the big deal with Aurifil thread? 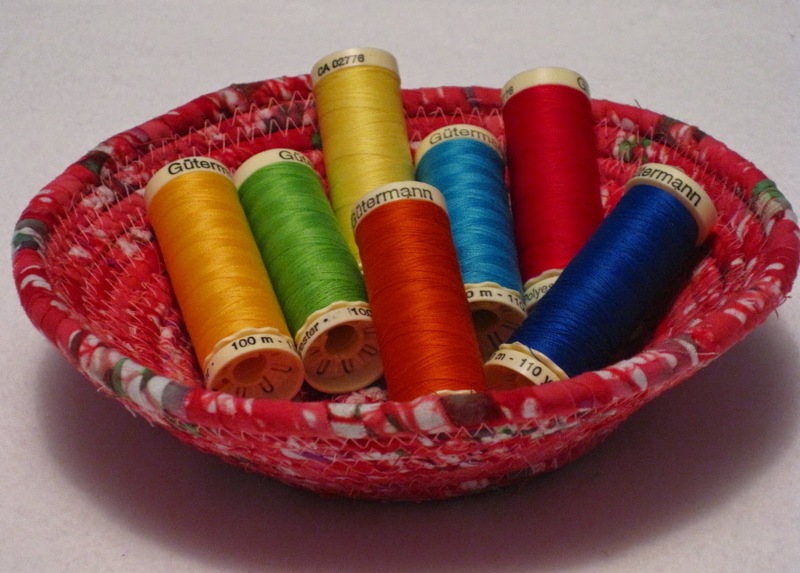 I have recently tried Aurifil, and although it's a decent thread, it didn't impress me much. And since it costs a lot more than Gutermann, I won't be using it unless I can find it on sale. I use Gutermann thread because one of my LQS often has 50% off notions, so I stock up. I have also recently tried the Essential thread from Connecting Threads. I do like this thread, and at about $3 for 1,200 yards, we have a winner!! 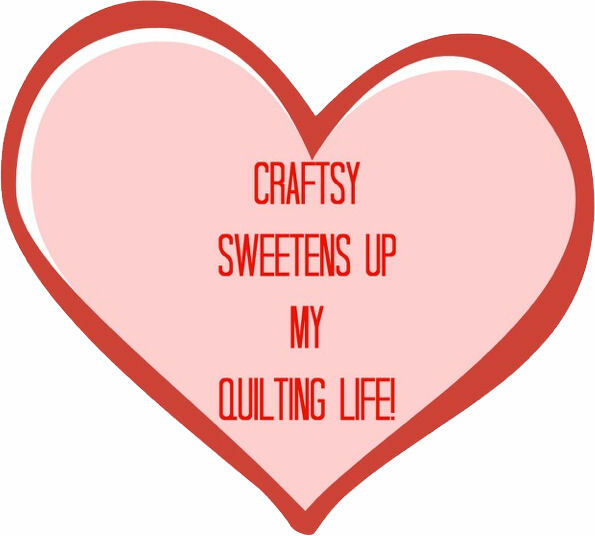 What are your quilty secrets? I love when fabric arrives in the mail! 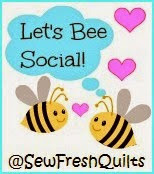 This week it was my Bargain Lover Fat Quarter Club collection from Sew Sisters Quilt Shop. I love chevrons, but I'm not sure what to do with these. Some of the colour combinations are not ones that I would choose. It's hard to tell in the picture, but the yellow and orange at the top are both paired with green. 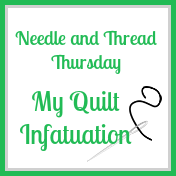 As I was working on my blocks today that I started at yesterday's Maritime Modern Quilt Guild Sew In (more on those in a later post), I had a brainstorm. I've been struggling with what to make for two baby gifts that are needed in the next several weeks. The vision requires me to think outside the box as I'm trying to re-create something I saw online, but trying a different technique as I don't want to make HST's. I don't know if I can make the vision come to fruition. It's time to get out the paper and pencil to do some calculations. 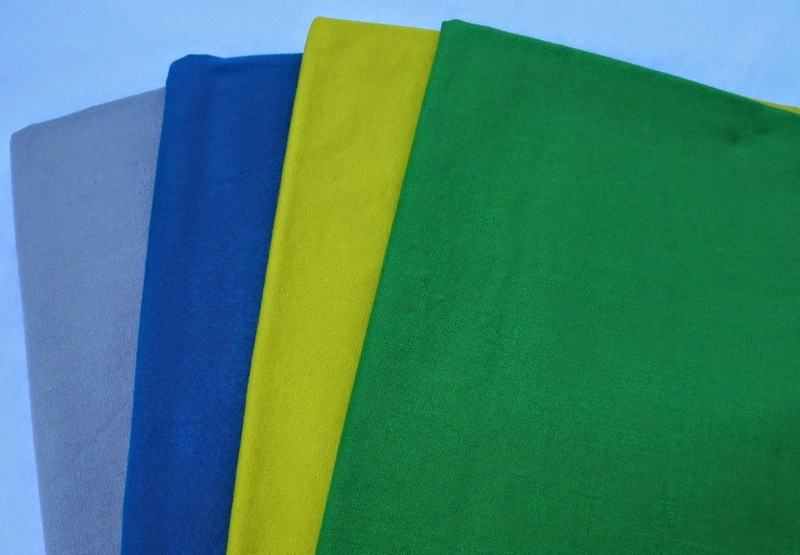 Here are the fabrics I'm going to use. 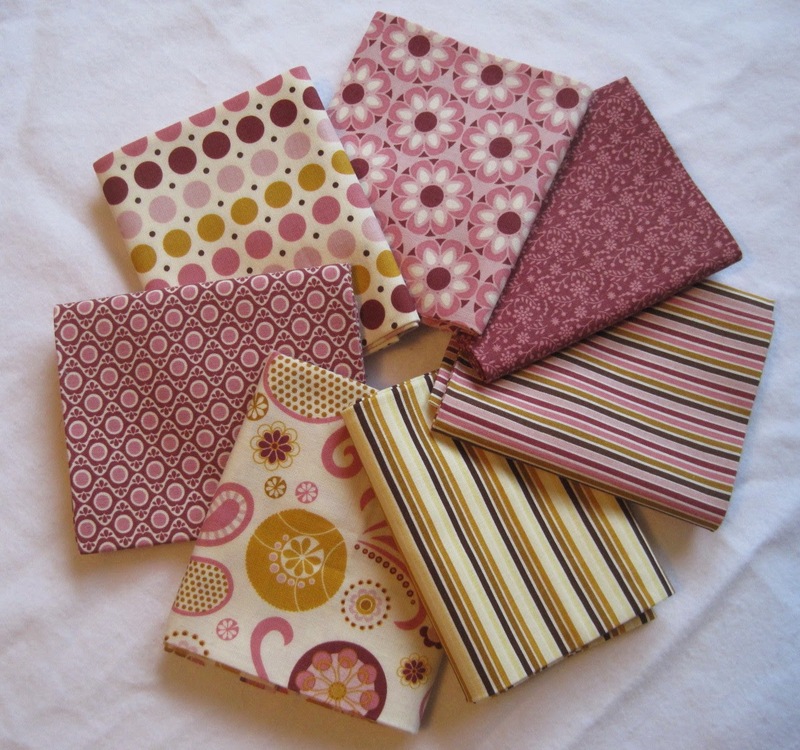 These were a previous fat quarter collection from Sew Sisters. Don't you just love that smiling octopus. And the whale. And the starfish. How cute are all those wonderful water creatures. My camera didn't seem to pick up the colours very well, but those are Kona Ash, Cyan, Citrus, and Kiwi. I'm on vacation this week so hoping to get some finished tops quilted and off my WIP list. There are lots more projects I want to start. 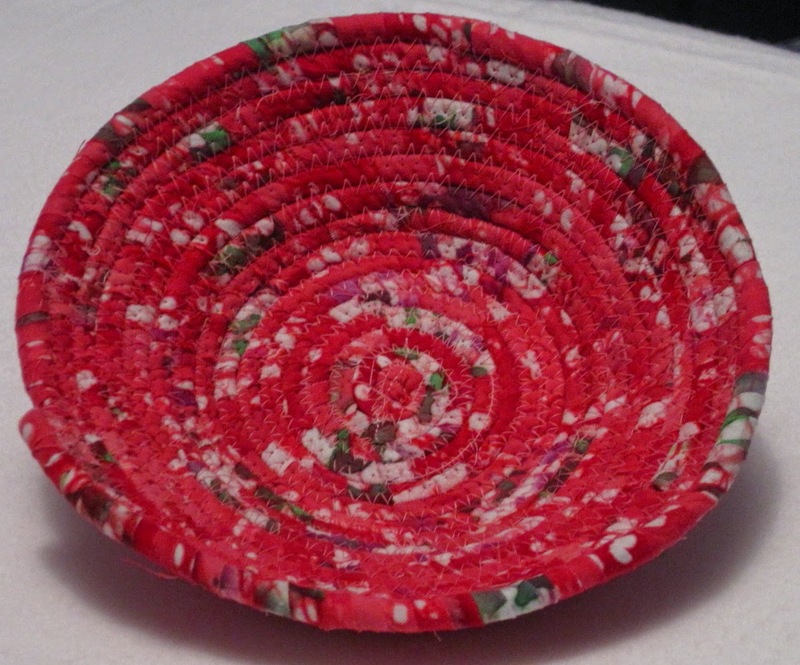 At our last Maritime Modern Quilt Guild meeting, Jo over at Explorations in Stitch did a demo on making fabric bowls. So I decided to give it a try. Those who know me, know I don't do well without a pattern. But I decided to give it a try anyway from memory. I decided to stay small for my first attempt, and I am pleased with the finished product. The sides are a little more angled out than I had planned. I was so focused on ensuring I was sewing it so that the thread was catching both pieces of the cord that I often forgot to keep the bowl angled up. Oh well...I'm still pleased with my first attempt. I will use it tomorrow as a thread catcher at MMQG's Sew In. Since I enjoyed making this, I will investigate a book purchase so I can learn more. 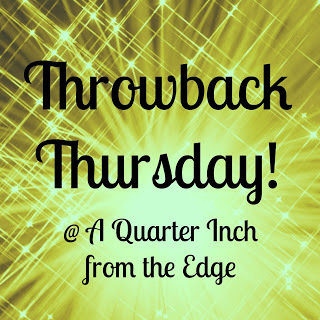 Since it's Friday, I'm linking up with TGIFF. 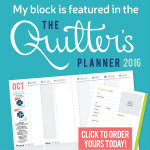 Leanne @ the Devoted Quilter is hosting this week. 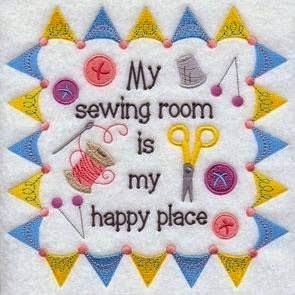 Off to find a project to work on tomorrow at the Sew In. Sunday Stash -- I'm a Winner!!! At last week's Maritime Modern Quilt Guild meeting, I won the door prize!! 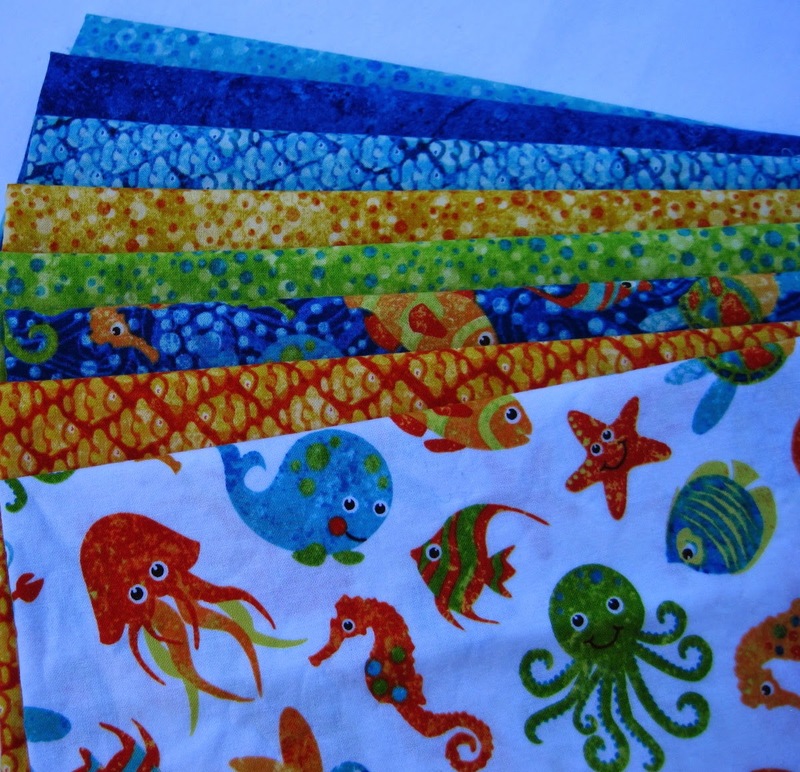 I never win and was very pleased with these seven fabulous fat quarters. I don't know what I'm going to do with them. Guess I need to starting searching the internet for some inspiration. My friend Jenn over at A Quarter Inch from the Edge was recently Queen Bee in her online bee. I really liked the block so thought I'd make her one even though I'm not in the bee. The block is called Converging Corners. I realize now that the colour in each section didn't end up being longer than the colour in the previous section. Hopefully it won't be too noticeable once all the blocks are put together. This is the second improv block I've done. Could it be that Jenn is starting to have an influence on me??? I decided to make a skirt for my goddaughter T while she was visiting. I found a pattern for making a reversible skirt at Blissful Sewing. So I decided to give it a try. It's not as easy as you'd think to photograph a skirt. The pattern calls for the waistband to be one of the fabrics used, but I decided to use black as it's featured in both prints. T has seen and tried on the skirt because I needed to make sure that the elastic was adjusted accurately for her. And I didn't make the skirt as full as the pattern called for. Good call on reducing the amount of fabric. And the pattern called it spot on for the length of elastic -- waist measurement less 2 inches. If you are looking for a skirt pattern, I recommend this one from Blissful Sewing. The instructions are clear, and there are lots of photos. I recommend you read the pattern from beginning to end first and make note of the measurements before you cut and sew fabric. But then I wanted to make more skirts. I didn't realize how easy and fun they'd be to make. This skirt is not reversible as I didn't have a print to go with it. I also found a skirt pattern that had leggings attached to the waistband. But I didn't end up making it because the pattern called for cutting off the waistband of the leggings, sewing the leggings to the skirt, but then sewing the leggings waistband back to the skirt. It just seemed like a whole lot of extra work. I had already purchased the knit fabric, so I just made the skirt following the pattern above. T can just wear leggings underneath the skirt if she chooses. I made the knit skirt a little fuller than the other ones. We'll see how that works out. I hope it's not too much fabric. So now I'm itching to go fabric shopping to buy skirt fabric. 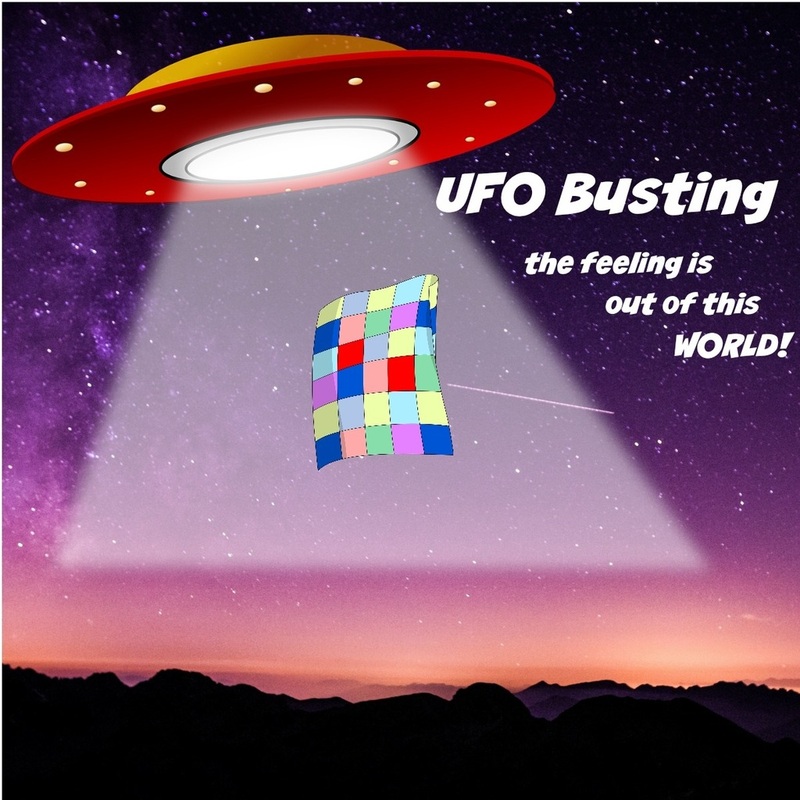 Like I need another project to work on, with all UFO's sitting in my sewing room. But the skirts are so fun and whip up quickly -- instant gratification. Last night's plan was to close up the waistband on the purple skirt and to make a start on the second skirt. But I was having so much fun that I ended up staying up late to make two skirts. And now my WIP post has become a finished project post. 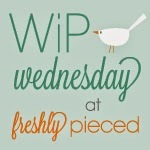 But I'm still linking up with WIP Wednesday over at Freshly Pieced. The quilting momentum continued today. 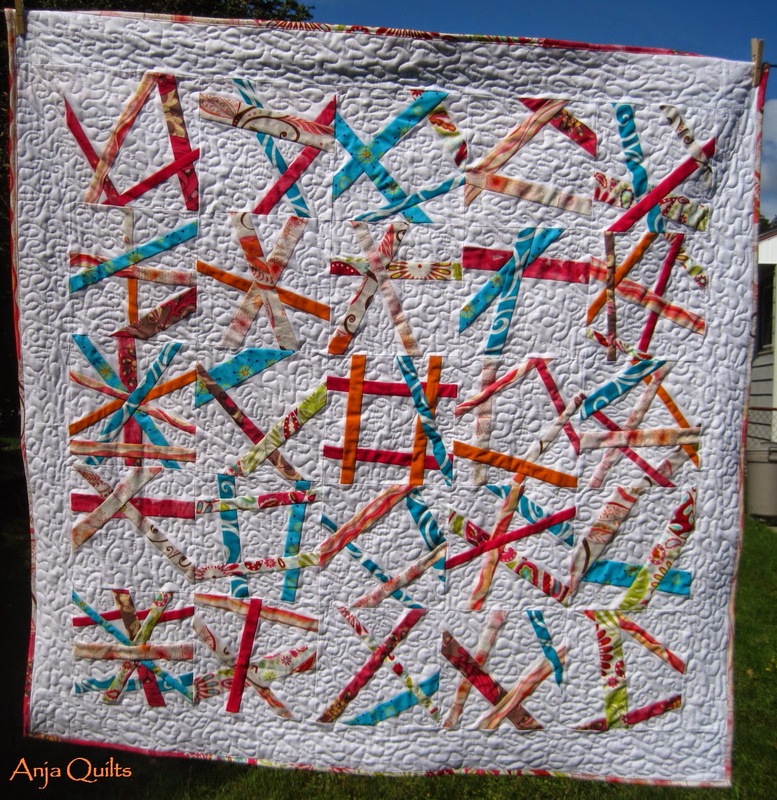 Two quilt finishes!!! 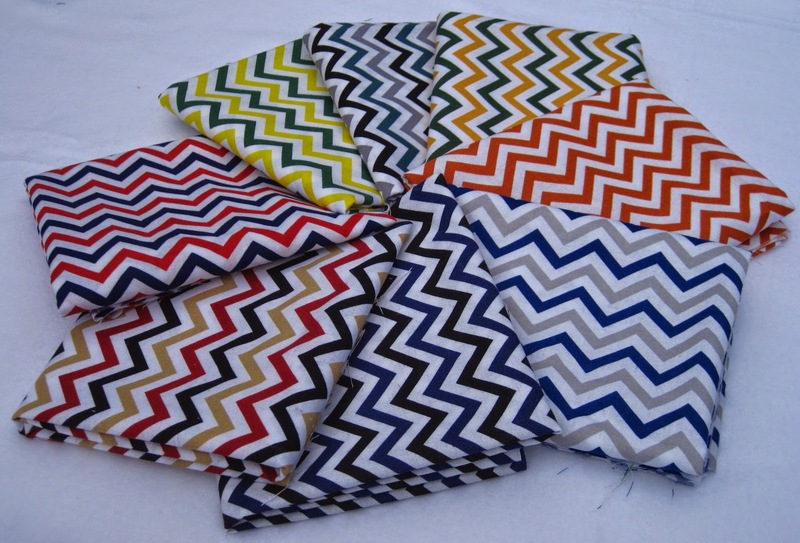 First up is the Broken Herringbone pattern I found over at Play Crafts. 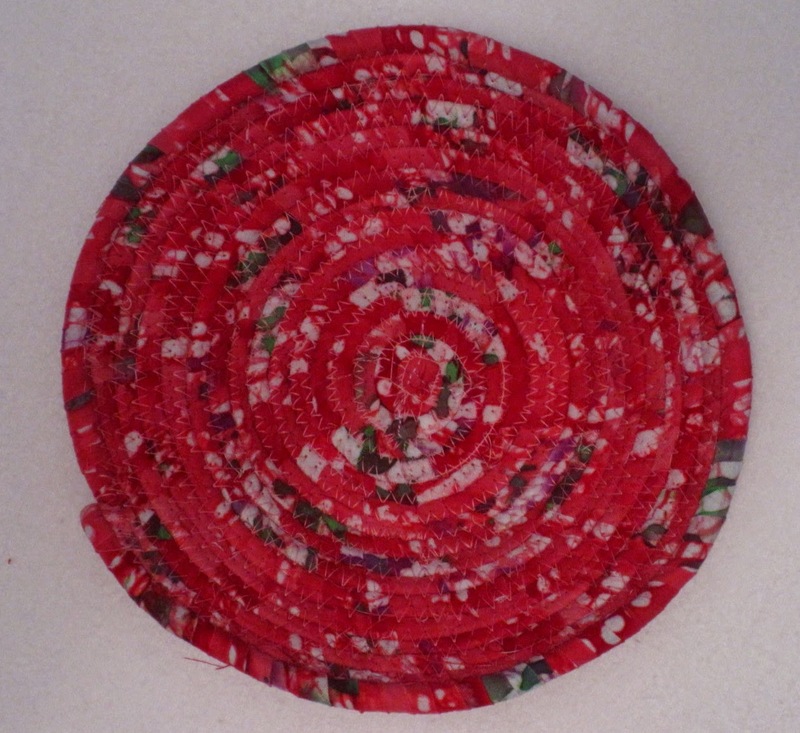 Spiral free motion quilting. Talk about moving outside of my comfort zone. I used Essential thread from Connecting Threads, size 50. At $3 for 1,200 yards, it was worth a try. 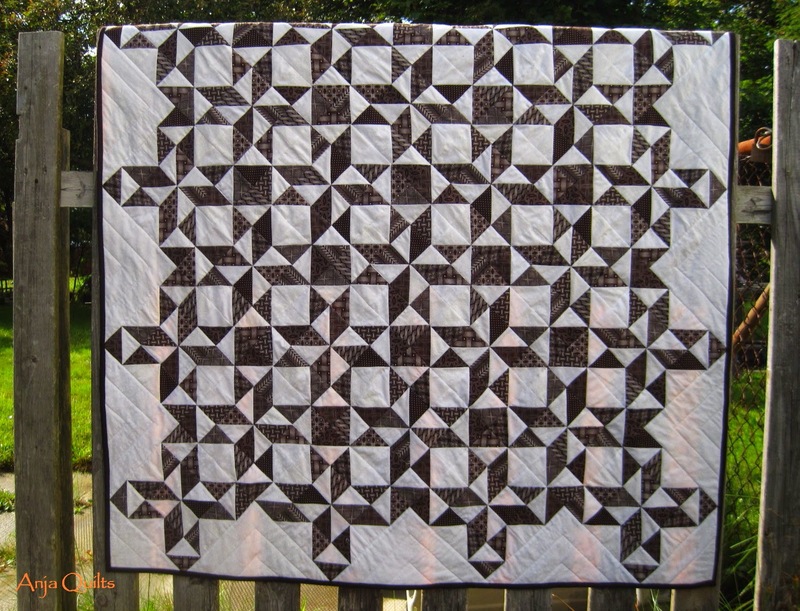 I was very happy with both piecing and FMQ. Will definitely purchase this thread again. At a Q-Squared bee sew day last weekend, Jenn over at A Quarter Inch from the Edge was doing FMQ spirals so I stood over her shoulder to watch. I think I like spirals!! The key is remembering to leave enough room to get back out. 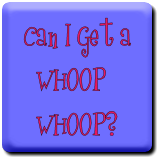 Hey, Scrapmaster, I'm starting to like FMQ. Since I was in the groove with FMQ, next up was the Shattered Glass Block from the Undercover Crafter -- all over meandering. 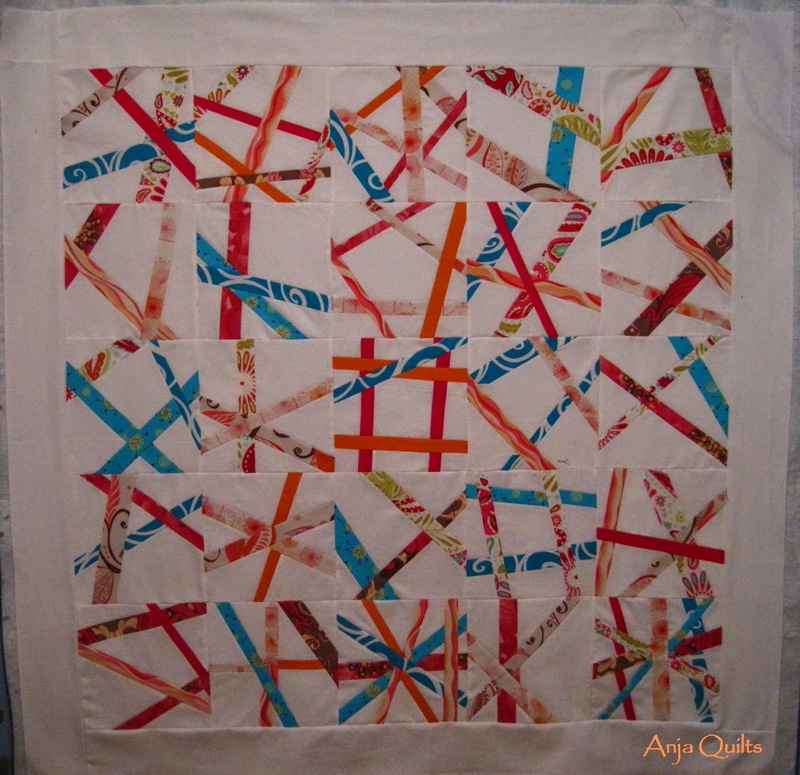 I quilted in the white space to make the coloured strips pop. I am very happy with the outcome. 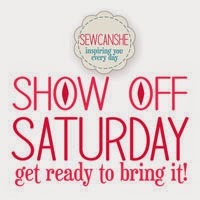 Proud of today's accomplishments, so linking up with Show Off Saturday over at Sew Can She. The plan was to have two Friday Finishes today, but my vacation day was temporarily hijacked by a work emergency. 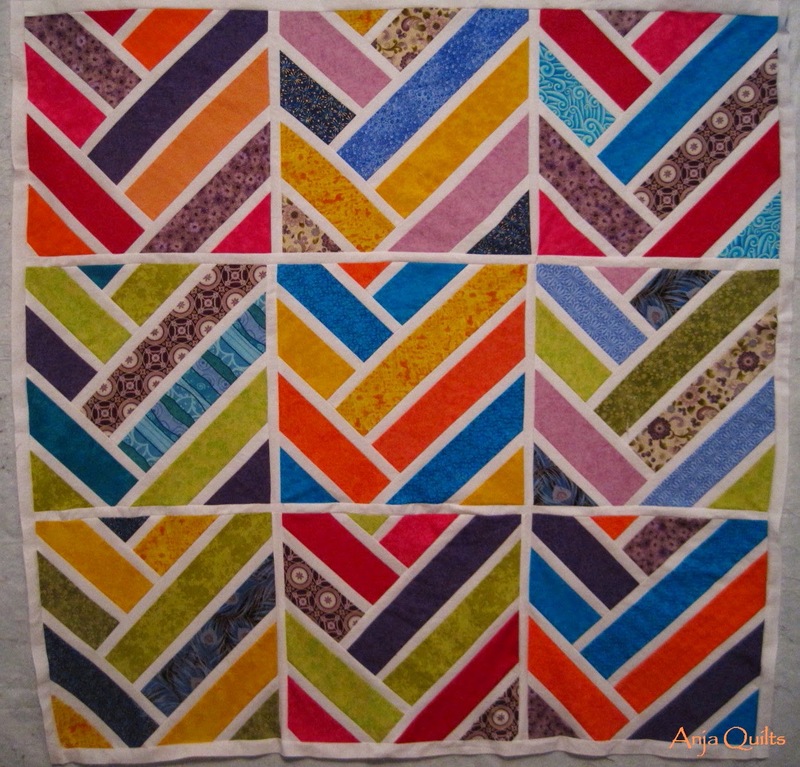 But I am so very happy that my Shweshwe quilt is finally finished. It's been two years since I bought the fabric in South Africa. 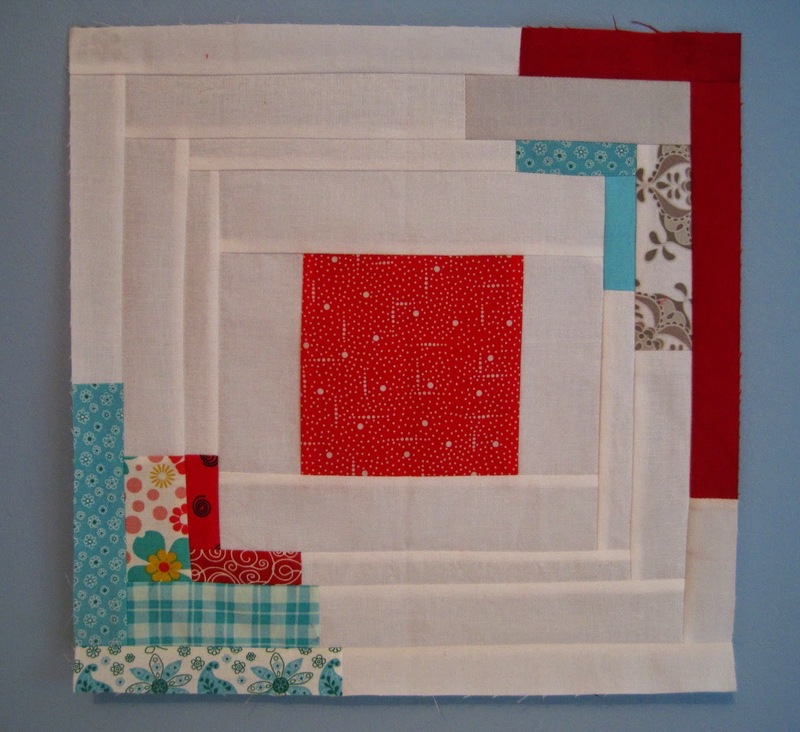 I wanted the focus to be on the fabric, so just simple stitch-in-the ditch quilting. 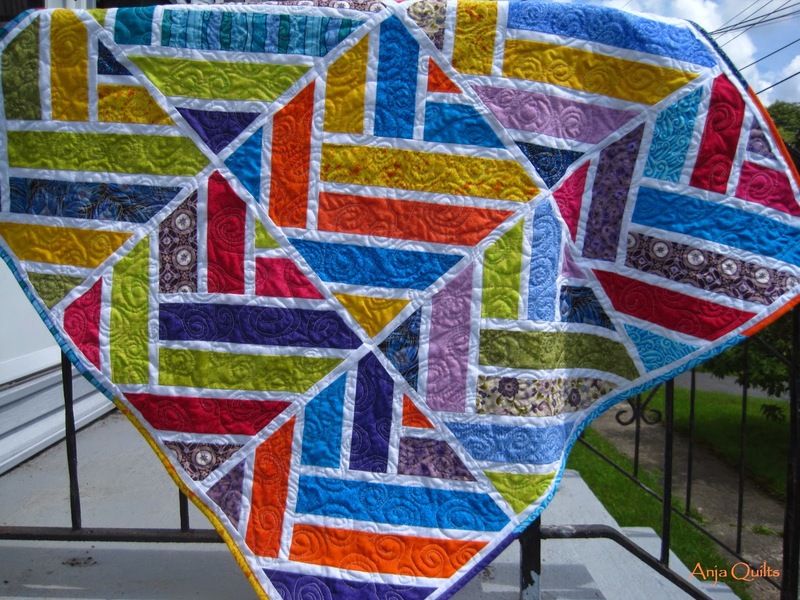 Every time I look at the quilt, I see a different pattern, so didn't want to take away from that. As I began to sew on the binding, the weather turned to thunder and lightning, and then the rain started. 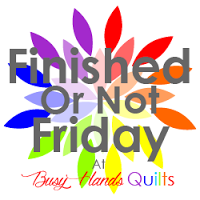 A Friday Finish was in the home stretch, but I wouldn't be able to take a photo and share. But I powered through and finished the binding. As I was clipping threads, the rain stopped and the sun started to came back. Grab shoes and camera and hit the backyard as fast as possible. I wanted to get a few photos before the rain came back. 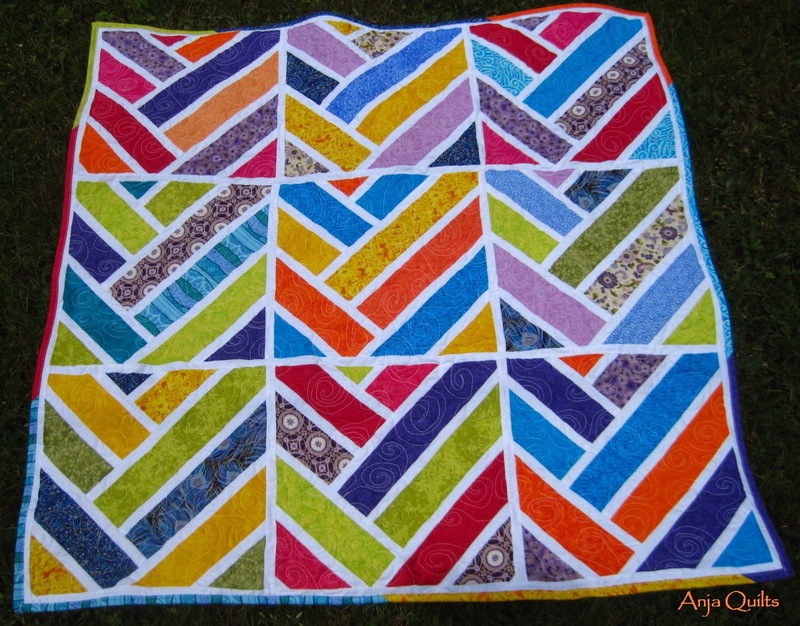 I stressed on what name to give this quilt and finally settled on: Shweshwe Adventure. 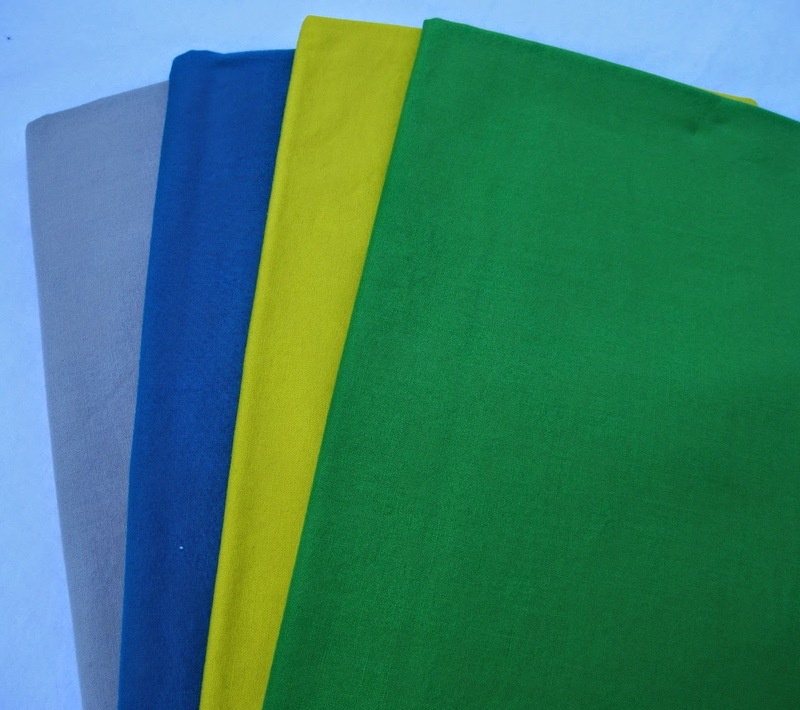 Shweshwe is the name of the fabric, and you can read all about it here. And it was both an adventure to purchase the fabric and to complete the quilt. My friend T and I were in South Africa for the wedding of another friend. Picture this: driving in a right-hand drive car, on the left side of the road, with no GPS, trying to find streets in Johannesburg which don't have street signs. My apologies...some streets were labelled....embossed in the curb. So very (un)helpful. It was quite an adventure to find the store. I think we drove around the same block three times. But we finally found it...after having taken the scenic route to get there. Thanks T for being patient. Now that it's finished, I want more Shweshwe fabric. I wish I had purchased more and wish I had purchased some of the blue and the red fabric lines. 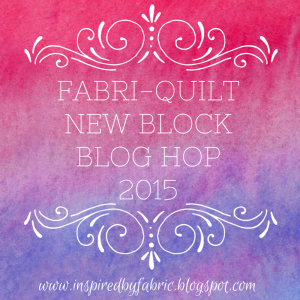 Linking up with Quilt Matters for TGIFF. 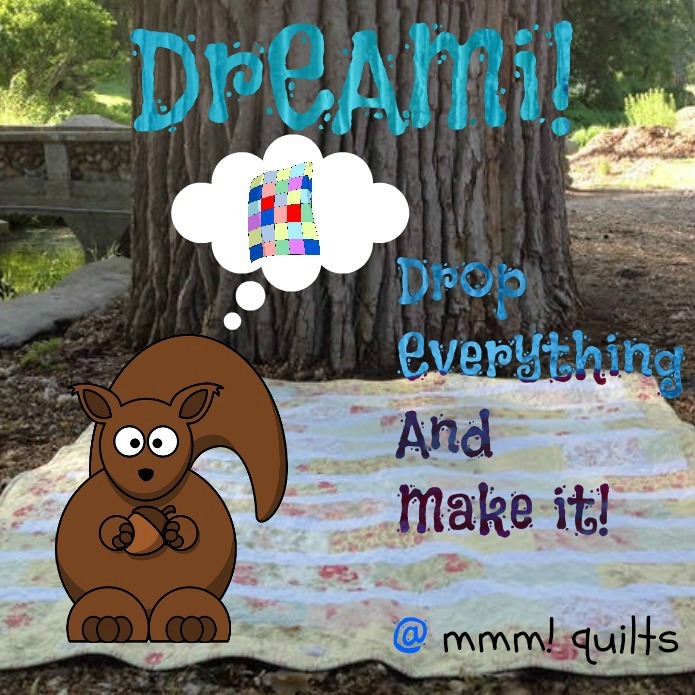 Check out her fabulous Modern Totems quilt. WIP...The Last of the Library Projects. It's been a tad warm in the evenings for sewing (but I'm not complaining -- just commenting). Combine the warm weather with my newly acquired hot flashes...it doesn't make for a pleasant sewing experience. But it's time to get some sewing done!! I finished the quilt top for my fourth and final The Library Project hosted by Adrienne over at Chezzetcook Modern Quilts. I wanted to try the Broken Herringbone tutorial posted by Play Crafts. I've been attempting to try new things to get out of my comfort zone. I'm glad I tried this block, but it's not for me. I didn't enjoy making it, and there is a lot of wasted fabric. The horror!! Now I have to find something to do with the scraps. The tutorial was great in that the instructions were very detailed and clear, with lots of photos. I was so very much done at six blocks. The Squares (one of my quilt bees is called Q-Squared) had to convince me to make three more blocks so that I could actually make something useable. It finishes about 40-inches square. The purples in the photo don't show very well, but I guess that's the price of taking photos in the house. One of the (many) downfalls of working full-time is that by the time I get any sewing done in the evening, it's too dark outside to take photos. 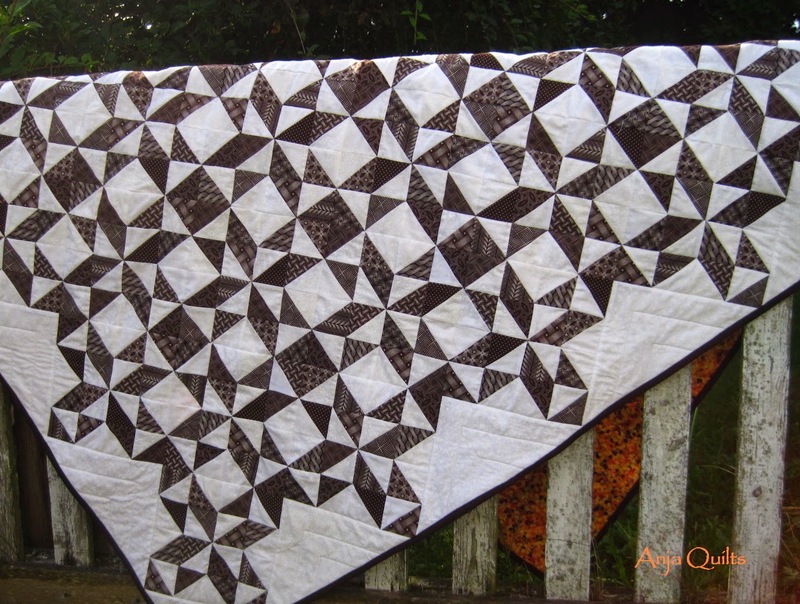 I've been hesitant to try improv piecing as I'm a girl that needs a pattern. But I liked a block posted by Jenn over at A Quarter Inch from the Edge, so I decided to give it a try. I did 8-inch blocks as indicated in the tutorial by The Undercover Crafter. I did enjoy making these blocks, although it was difficult not to try to line up all the strips. I did attempt to line them up in a few blocks...couldn't resist the temptation. Now the dilemma...how to quilt??? Any suggestions? Now that I have a collection of quilt tops, it's time to get focused and get them all sandwiched and quilted. And then come up with some names for them. Since it's Wednesday, I'm linking up with Freshly Pieced.